A good friend of mine will be signing his personal bankruptcy papers this week. He already shut down his construction business, fortunately without owing anyone. On the personal side, though, he’s underwater everywhere. His home and truck are both worth much less than the outstanding loan balances. He has a big chunk of credit card debt that he’s paid on for years (probably paying the original loan down several times) that just keeps growing at high interest rates. We’ve all heard this story often, I’m just seeing it up close this time. My pal builds to an amazing quality level. He has an artist’s eye and gets decent production as well. Whether winning awards for his finish carpentry work on a local college project or building beautiful built-in furniture, he’s an amazing tradesman. Admittedly, he probably shouldn’t have his own business. Too quick to empathize with his customer’s point of view, he lacked the attribute to protect himself. He didn’t ever charge enough, always worried that he’d lose the work or that he wasn’t being fair. So what’s he going to do? He’s going Aborigine. Moving to the Appalachian Mountains, he’ll live with a group of people that teach others how our ancestors lived…no electricity, making tools for building, hunting or harvesting for food and all that goes with a primitive lifestyle. All his tools are sold. Most of his other possessions he hauled to the Penryn Mud Sale and sold at auction. I took some stuff to that sale as well. 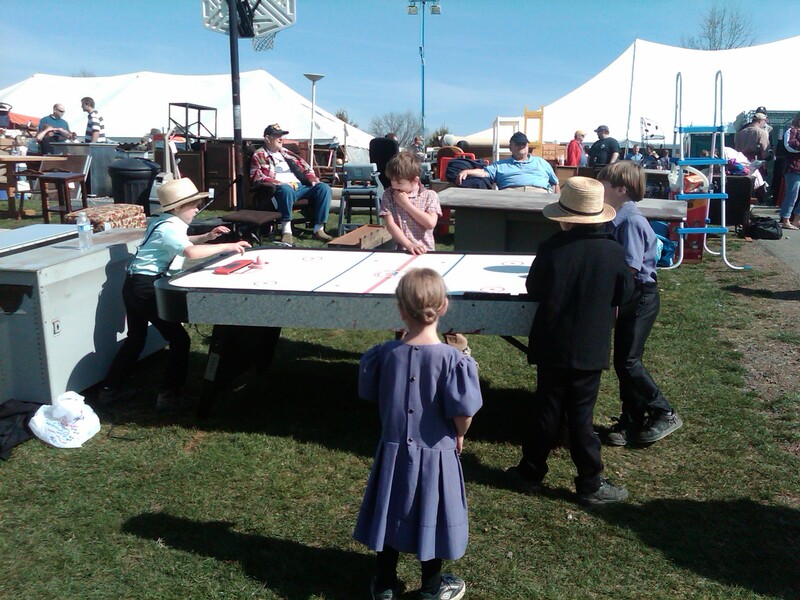 Below is a photo of some Amish kids having a great time playing on an old air hockey table we wanted to get rid of. As I was walking around the sale, I saw an Amish framer I work with often. Elam was there with his twin 3 year old sons, who had to be the cutest little guys I’ve ever seen. He and his wife got there in their horse and buggy, yet his crews frame with air nailers and electric drills and have cell phones. I’ve lived around the Amish my entire life and have a basic understanding of how and why they stay Amish. For most, it’s just how they were raised. Everyone’s upbringing seems normal to them. Sounds like a great adventure doesn’t it? Perhaps we have much to learn by looking back? Would you be ready to step back in time? I remember that air hockey table!